How do I install Ubuntu alongside a pre-installed Windows with UEFI? I'm absolutely new to Linux. I would like to know how to install Ubuntu alongside the pre-installed Windows 8+ OS. Should I do it with Wubi, or through the Live USB/DVD? What steps do I need to take to correctly install Ubuntu? Finish installation and see Ubuntu install without any issue with Windows or Ubuntu. Now, this is not a 100% full proof verification. Am just mentioning that I am impressed by the fact that out of 43 total Laptops, 43 did not have any issues whatsoever on my end. Still, if you do have an issue, this is the reason why this guide was created. Secure Boot which prevents anything but the installed operating system, in this case, Windows 8 from booting. This is no longer the case for Ubuntu since 12.04.2 so there is no need to disable secure boot. "Secure Boot" is a new UEFI feature that appeared in 2012, with Windows 8 preinstalled computers. Ubuntu supports this feature starting with 12.10 64 bit (see this article) and 12.04.2 64 bit, but as PCs implementing support for it have only become widespread at the end of 2012 it is not yet widely tested, so it's possible that you may encounter problems booting Ubuntu under Secure Boot. 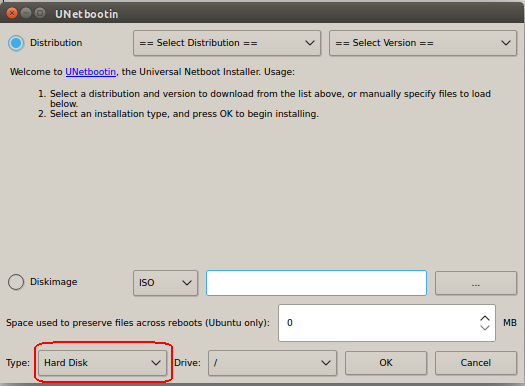 It is not required to disable SecureBoot in the firmware to install Ubuntu on a Windows 8 machine. Ubuntu 12.04.2 and 12.10 are SecureBoot-compatible. Any machine that ships with the recommended Microsoft Third-Party Marketplace keys in firmware will be able to boot Ubuntu under SecureBoot. If there is any problem file a launchpad bug for the shim package. I also want to notify that I spend this week testing 15.04 and had an excellent outcome. Of 12 Laptops ( 4 Toshibas, 3 HP & 5 Lenovo) where Windows 8.1 was pre-installed, on all cases, Ubuntu detected the Windows Boot Manager correctly, gave the option to install alongside Windows 8.1 (It actually said Install alongside Windows Boot Manager) and solved any issues that appeared on previous Ubuntu versions. I basically did not have to do anything else on this cases. This was with Secure Boot on and on an EFI enabled boot system. I also. Tested 4 Windows 10 PCs and it worked perfectly with 15.10 & 16.04. This does not mean that in your case it will work perfectly, it just means that on my cases, I had a 100% Ubuntu Perfect installation. Again, with 15.04 (Also on 15.10 and 16.04. On all cases it was 64-bit). I even had talks with users like Marius Nestor from Softpedia who actually had to disable Secure Boot in order for the installation to work, so it should be noted that, even if I currently have an excellent experience with Secure Boot, you might not. Keep this in mind when all else fails (We can thank Marius for his excellent contribution). I would in any case, send the bug report to the provided link above. So with all of this said, installing Ubuntu via WUBI is not doable (not recommended at least from me), things like trying to boot for example with the Windows 8 bootloader are not possible right now unless something changes in the future (There are also some bugs related to this in launchpad, like the one mentioned by bcbc). Apart from this, WUBI does not work from within Windows 8 and up if you have UEFI with a GPT Partition (Not MS-DOS type partition). 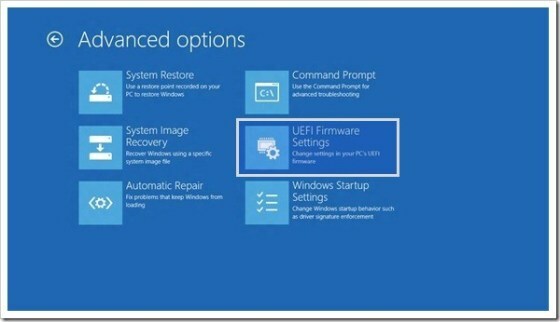 Pleas read Does UEFI support mean Wubi will now work on laptops shipped with Windows 8? for more information. Not only that, but trying to install 32 bit Ubuntu is impossible. You need the 64 bit version for everything to work correctly. Read more about Wubi in Can I install Ubuntu inside Windows? The following is a small guide to install Ubuntu with a Pre-Installed Windows 8 or 10 system. The steps HAVE TO BE done in the precise order I mention them here to get everything started. If a step is skipped or done before another, you will most likely end up with some of the problems mentioned at the bottom of this guide. You are using a 64-bit version of at least Ubuntu 12.04.2. 32-bit versions will not work. You are not installing Ubuntu inside of Windows 8 or 10 but rather alongside of it. Inside it is impossible because it needs Wubi which is unsupported. Your system has UEFI activated (And cannot be disabled) with Secure Boot. You have already created a free space for Ubuntu from within Windows 8 with at least 8 GB (I recommend to leave at least 20 GB or so, so you can test the hell out of it). You made sure that you actually have free space left on the drive to create the needed partitions and you also made sure that you did not have all primary partitions used (In case of using an MS-DOS Scheme) because this will create a problem with the Ubuntu installer showing you only the "Replace Windows" option instead of the "Alongside Windows" option. You know how to burn a LiveCD, LiveDVD or LiveUSB from within Windows 8. If not, look for Windows apps that can do that for you. I do mine in another PC with Ubuntu ^^. 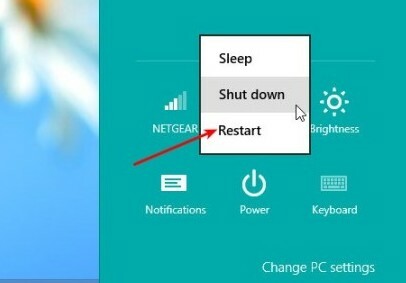 Windows 8 was not shutdown in either Hibernation mode or any other mode ('fast start-up' which is by default on Windows 8) that leaves it on a saved state. 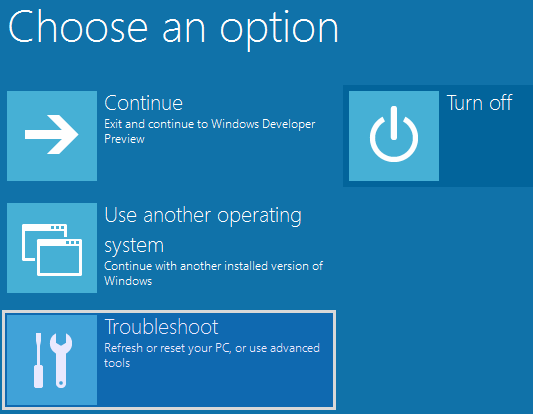 Shutdown Windows 8 in the normal way, with the shutdown option. This will prevent other problems related to this from appearing. Read the bottom (TROUBLESHOOT) of this answer for more information regarding this point. You are installing on an MS-DOS type disk scheme (You can only have 4 primary partitions as opposed to GPT Scheme) which has at least 1 Free Primary Partition (You can find out the type of scheme you have from here if operating on an Ubuntu Live CD or here if from Windows). Remember that if you are already using 4 Primary Partitions no partitions will appear on the Ubuntu installer since there are no more Primary partitions left to use (MS-DOS type partitions are limited to 4 Primary ones, GPT are limited to 128). This happens a lot on many laptops that come with 4 pre-created primary partitions. If you are installing on a GPT type partition and want it to boot, you need to leave UEFI enabled. PLEASE READ THE ABOVE POINTS SINCE MANY USERS JUMP THIS PART AND WHEN THEIR PROBLEMS ARE FOUND IT NORMALLY IS BECAUSE THEY DID NOT FOLLOW ONE OF THEM. Run compmgmt.msc on Windows 8. From there on, create a partition with enough size. Note that I mention creating this FROM Windows 8 because I have had cases where doing the partition from the LiveUSB rendered Windows 8 unbootable, even after doing a boot repair. So to remove that problem or have a greater chance of removing it (Or simply skipping the problem altogether) and making sure both systems work, partition your hard drive from within Windows 8 first. NOTE - In the Spanish version of Windows 8, the option for UEFI Firmware Settings is not available in several laptops, tested Lenovo, HP, and Acer. They do have an option to boot the computer and another custom menu will appear which lets you do a couple of things. In the case of Lenovo, you will not have an option to install Ubuntu with Windows 8, the only option is to remove Windows 8 completely. This only applies if you are not using 15.04+. In this part, I can't help much since each BIOS is different for each Motherboard model. There are 2 options you can take here, both of which are optional since Ubuntu might install without any problems at all. You can either look for an option to disable Secure Boot or an option to disable UEFI. 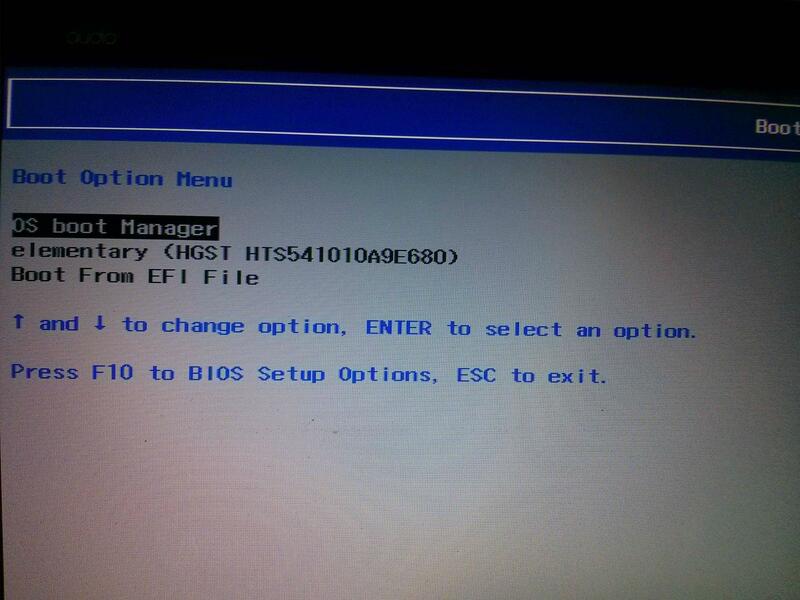 In some cases you will be able to find both, it will show in the BIOS as an option called Secure Boot or Enable UEFI. If you find this options, then depending if you cannot install Ubuntu with Secure Boot enable then disable Secure Boot (Remember to report this as a bug using ubuntu-bug shim), to be able to still stay in UEFI mode and also be able to Boot with Ubuntu. In some motherboards, this will be the only option you actually need to change and also will be the only option you see related to UEFI because they will not offer the possibility to disable UEFI. I would also like to mention an important note here. If you happen to install Ubuntu in Legacy Mode (No SecureBoot) you might have problems booting both, Windows and Ubuntu at the same time since they will both not appear on a Dual-Boot Menu. If you have Windows on UEFI for example and you install Ubuntu on Legacy Mode, you will only be able to boot to Ubuntu in Legacy Mode and Windows in UEFI Mode. So if you have ANY dual boot problems, this could be the problem. Please read the Ubuntu UEFI Guide since it covers various ways of solving Dual boot problems and converting Ubuntu to Legacy or EFI mode. I have already tested this with various Ask Ubuntu members that helped me apart from 2 Laptops I was provided with for the testing. This should then solve any Dual Boot problems related to Windows 8 + Ubuntu, but I again encourage anyone with problems (same or new) to file a bug report as mentioned above. The Ubuntu Developers are working very hard in providing an easy to install solution for all cases and this is one of the top priorities. Continuing with the guide, in other motherboards that do offer the possibility to disable UEFI which would completely eliminate UEFI and Secure Boot on it and boot in the normal BIOS like way, if you find this is the way you want (To have a UEFI free computer and not face any of the problems related to this) then, by all means, do it. I for one have tested the Intel DZ68DB and did both case studies. Remember that doing so will make the Dual Boot process not work in almost all cases you will be left with a system that either Boot Windows in UEFI or Boots Ubuntu in Legacy. With that in mind, remember to also select the Boot Order to make sure that it boots either your CDROM, DVDROM or USB Drive so you can boot from your Live Ubuntu image after rebooting. 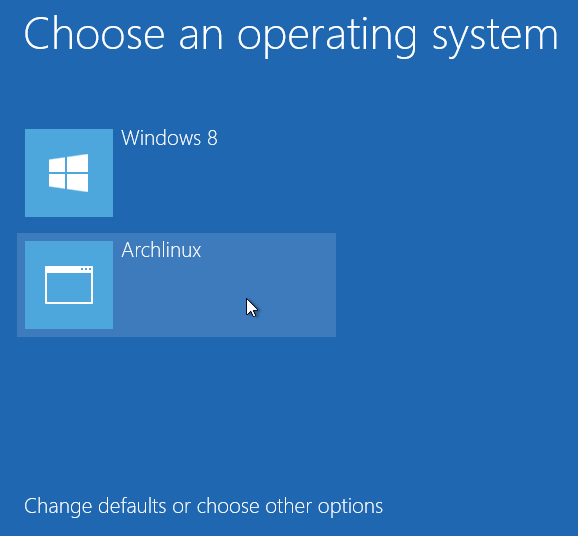 If Windows 8 was installed with UEFI enabled, it is highly recommended to stay in UEFI, although if you still want to disable it for specific reasons you can, GRUB will create the bootable part for Windows 8. But if you do disable UEFI and want to access Windows 8 afterward (before installing Ubuntu), it will not work since the boot part for Windows 8 needs UEFI (Again the Dual Boot problem). If you only disable Secure Boot, there is no problem in some cases. You are only disabling the part that creates the most problem between Windows and Linux, which is the one that prevents Ubuntu from booting correctly. In either case, I encourage you to first try to install Ubuntu with UEFI/Secureboot, since in most cases it will work. if you disable any of them and install Ubuntu, you might not be able to boot to Windows 8 afterward through the GRUB Boot Menu. 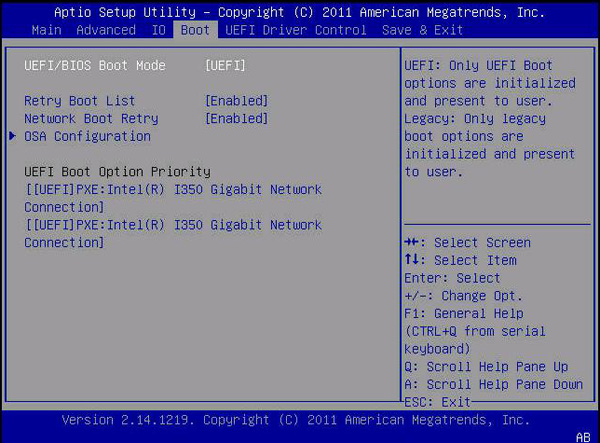 And lastly, others offer a UEFI/Legacy Boot First option where you select which one you wish to use first. Obviously, the option is self-explanatory. When the Ubuntu Live image starts, it will show rather different than the normal one we are all used to. Do not worry, this is because Ubuntu has an alternative boot option when a system has EFI installed. Just select everything like you are used to. I highly recommend reading the following article in the Ubuntu site regarding Ubuntu installations when using UEFI. If there is a problem, then try to create a small partition (About 250 MB of size) for the EFI part of the system. This is done in the installation part where it asks you if you want to install on the desired partition or used the Advanced Options. Select the advanced options if you come up with a problem. In there, create a 250 MB partition for EFI and the rest for GRUB and other stuff you are accustomed to. Notice the "UEFI Boot Option Priority" or "Boot Option Menu". Usually, Windows is the default and Ubuntu (or as in the second picture elementary OS) will be an option. Once you select Ubuntu on the UEFI boot menu you will then get a grub menu. You should be able to boot either Ubuntu or Windows from the grub menu. This will configure the Windows Boot Manager to take into consideration the GRUB Boot Manager. This could still happen even after running the Boot Repair from within Ubuntu. So making sure that Windows reads the Ubuntu EFI partition, in case you are using an EFI boot system instead of the old BIOS will solve it. In the above command line, the difference between shimx64.efi and grubx64.efi is that shimx64 is the actual Microsoft signed binary that works with Secure Boot enabled while grubx64 is the normal grub binary (Not signed). If you have followed all the steps above including making a partition ahead of time through Windows 8.x, proceed with the normal Ubuntu installation. When you arrive at the option to how you would like to install it if you do not see the option to install Alongside it, select "Something Else" instead of wiping the hard drive. Configure the new partition layout on the empty space you've set aside that isn't Windows 8 / 10. You need to create at least 1 partition for the root system (Which shows as the symbol "/") and set it to Ext4, another for SWAP (Virtual Memory). The SWAP space can be as small as 128MB if you have a lot of ram or as high as 4GB. With this 2 partitions created based on the empty space you provided you should be ready to proceed. And one last one for the EFI part which should be around 100MB. When the installer asks where to put the bootloader, tell it to put it on the partition with the type "efi". This will install GRUB which will load once your system starts in the future which will give you the choice of going with Ubuntu (or whatever flavor is installed) or going to the Windows Boot Manager which will take you to Windows 8. "Install alongside" option missing. How do I install Ubuntu beside Windows using "Something Else"? How do I install Ubuntu alongside UEFI enabled Windows 8? Boot Repair will mention that we have some GRUB error, that we have an EFI system and that Ubuntu rocks. Since Ubuntu rocks (It does not work if Ubuntu does not rock! ^^), just click on Apply so boot repair fixes everything. Now reboot and you should see Windows 8 and Ubuntu side by side. 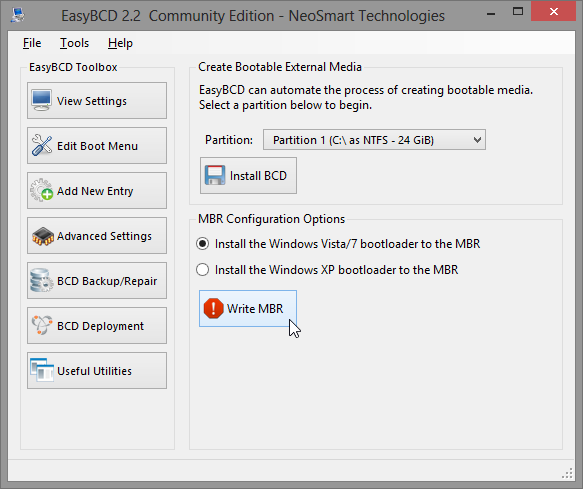 For cases with rare booting problems, partitioning or using old hard drives on a newer motherboard, your solution might be checking out FixParts which solves misaligned partitions and other partitioned type problems. This is most likely the cause of an option in Windows 8 called Fast Startup which behaves similar to hibernation and keeps a snapshot of the system so when you boot up, it will load faster. Since it keeps a snapshot, anything you copy or change in Windows 8 from Ubuntu after doing the fake shutdown will be lost (Apart from other issues found HERE). This should remove the hibernation file and enable partition to be mounted in Ubuntu. A demonstration video is now available on this issue. We can install Ubuntu 12.04.2 (64 bit versions) onwards with SecureBoot enabled. But we need to disable the SecureBoot after the Boot Repair step. Wubi doesn't work on newer computers with UEFI (see bug report http://pad.lv/694242). If you bought a computer with Windows 8 preinstalled it is almost certainly using UEFI (since this is required for Secure boot and all OEM Windows 8 computers are supposed to be secure boot). Wubi uses Grub4dos to locate the Grub2 wubildr file. There is no support for GPT disks built into Grub4dos (and UEFI uses GPT disks unless it's booting in hybrid mode). In addition, with Secure Boot, it's not possible just to add new boot entries as before. So, what you need to do is a normal dual boot. If you have secure boot (likely) then you need the 64 bit Ubuntu. If your computer comes preinstalled with 64-bit Windows 8 then you need to boot ubuntu using the secure boot option. In other words, when you are at the boot menu, choose to boot the drive as a secure device. Then you can install ubuntu. Most likely, after you install, you'll have to reboot after install using the disk and then do a boot repair. The other option is you can boot the drive normally, do a normal install, and then still reboot after install and do a boot repair. This was the option I ended up doing. Ubuntu 12.10 does a great job of resizing the windows partition and installing itself alongside Win8. For some reason, Grub is the problem. Once I installed, I could boot into Ubuntu with no problems but couldn't get into Win8. Running the repair got Grub fixed and then everything worked smoothly after that. You can do the same as you could in Windows 7, although I'm not sure I'd recommend it using the graphical boot menu (reason in the end). The usual setup for people who have dual boot configurations with Linux being one of the OSs that the machine has installed is to have a Linux bootloader by default, and there add an entry for the Windows OS. What that does is to load the Linux bootloader and if you want to load Windows it chainloads into the Windows bootloader which then boots Windows. Since usually there's only one Windows installed the menu selector of the Windows bootloader never appears giving the impression that the entry you added in the Linux bootloader actually loads Windows. The opposite is possible too, although not common among Linux users. For instance, my main bootloader is the one from Windows which then chainloads into a Linux one to boot Linux; I have configured the Linux one to be mostly invisible and load right away though. When you install Windows first: In this case when you're installing your Linux distribution, if it allows you to install the bootloader in a partition directly instead of in the MBR of the hard drive do so. After restart you'll find that you're booting Windows just like Linux was not installed at all, after that follow the scenario in which Linux was installed first described below. If you can only install the bootloader in the MBR of the hard drive after the reboot you'll see a Linux bootloader (Syslinux, GRUB, you name it), choose the Windows entry there and boot into Windows. Now, I like to use EasyBCD (free for personal usage) to deal with the Windows bootloader, but anything that I do with it can be accomplished without with the proper bcdboot, bcdedit, etc. commands. 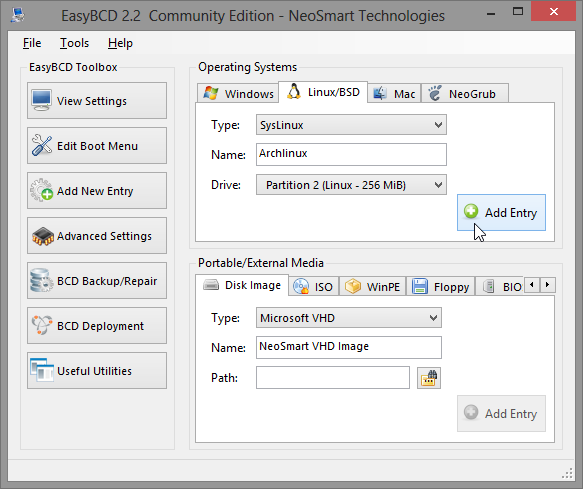 Open EasyBCD and go to the "Add New Entry" section and the "Linux/BSD" tab. Select the bootloader you have for your Linux distribution. In case of GRUB2 there's an autoselect mode which will select the appropriate partition for you, for Syslinux for example you have to compulsory select the partition where it is installed. Name the entry, the name you put there is the one that will appear in the Windows bootloader. When you install Linux first: In this case you don't have to restore the MBR (Master Boot Record, tells what to execute next grosso modo) as Windows installation will overwrite any previous value there. NOTE: with UEFI and GPT disks this may be different though, but I have no way of trying it out. Essentially because the way it works is different than with the textual menu (default for Windows 7). In Windows 7 (or Vista) you're first presented with the boot menu and then it starts to load whatever you choose to, in the new graphical menu it first loads some stuff (= takes time) and then presents you with the boot menu. If you don't select to load Windows 8, it reboots the machine and starts to load whatever you selected which in this case is the Linux bootloader. I find waiting to load some stuff just to discard it and reboot unnecessary if I just want to boot another OS; but it's my personal opinion on the matter, there's no problem whatsoever by loading Linux, or any other OS in this manner. Anyway, there are different ways to use the textual boot menu instead in Windows 8, if you're interested check this answer out. Create a LiveDVD or LiveUSB of Ubuntu (>=12.04.2) 64bit ONLY. In your BIOS, disable QuickBoot/FastBoot and Intel Smart Response Technology (SRT). If you have Windows8, also disable FastStartup. Boot your PC using the LiveDVD or LiveUSB and choose "Try Ubuntu". If you get a Secure boot or signature error, you may wish to disable SecureBoot, then retry to boot the disk. Install Ubuntu from the Live CD/DVD or Live USB in the usual manner, then reboot the PC. If the PC does not load Ubuntu (but instead loads Windows, for example, as in Bug #1050940), or if the Windows entry in the GRUB 2 menu does not boot Windows (see Bug #1024383), boot your PC using the Live CD/DVD or Live USB and choose "Try Ubuntu" once again. When the live session has loaded, run Boot-Repair (see link for details). When Boot-Repair loads, click on the "Recommended repair" button, and write on a paper the URL (paste.ubuntu.com/XXXXXX/) that will appear. Then reboot the pc. This should fix most boot problems. If this does not fix your boot problems, please create a new thread in this forum, describing your problem and indicating the URL you wrote in the previous step. Source: Lifted word-for-word from this wiki. To install Ubuntu alongside Windows 8 (with UEFI, GPT support or not) is a simple or not so simple task, depending on your computer's specifications. Many things have been said in this answers and some of them are obsolete, as Hellreaver noticed. Because every new question about this topic is redirected here, I feel obligated to respond. Now I am not a programmer, so if I can do it, you can do it. There might be a little difference between desktop and laptop computers, hence I will explain first for the desktop (easier) version. Many forms of UEFI are out there and every manufacturer has its own solution. For example, I use Lenovo Y580 laptop and it doesn't have an option to boot from a DVD. So I will present a universal solution (and the fastest one) - install Ubuntu from USB. To properly make a bootable USB you need to download RUFUS. Do not use Wubi (nor UNetbootin...) because to my knowledge, at the present time, they do not support all these technologies (UEFI, GPT...), so the only option that I know of and have tested successfully is Rufus. It is a simple and effective program. In case you are wondering whether you have GPT partition table or MBR, you can check this by opening Windows Disk Management, right-click on Disk0 and select properties/volumes tab/partition style. As for other UEFI options, as Luis Alvarado mentioned, you might want to try installing Ubuntu with Secure boot enabled. If boot fails then disable it. You should also disable fast boot (if available) and enable USB boot as well. If everything else fails then you should install Ubuntu in Legacy mode. Afterwards, use Boot-Repair tool to adjust Grub2 (it is an automated process). Then you can boot both OS from the same UEFI mode. For some reason (probably a bug) my UEFI doesn't recognize the bootable USB at first entrance, so I have to boot twice into UEFI to change the boot device order. As for the installation of Ubuntu itself, if you are new to this procedure, take my advice and you should see some explanatory video, for it is reported that some people had some issues when it comes to selecting the installation type. Of course, if you want Windows alongside Ubuntu, you should choose the "Something else" option, it's the last one – not the first, as shown on the screenshot! 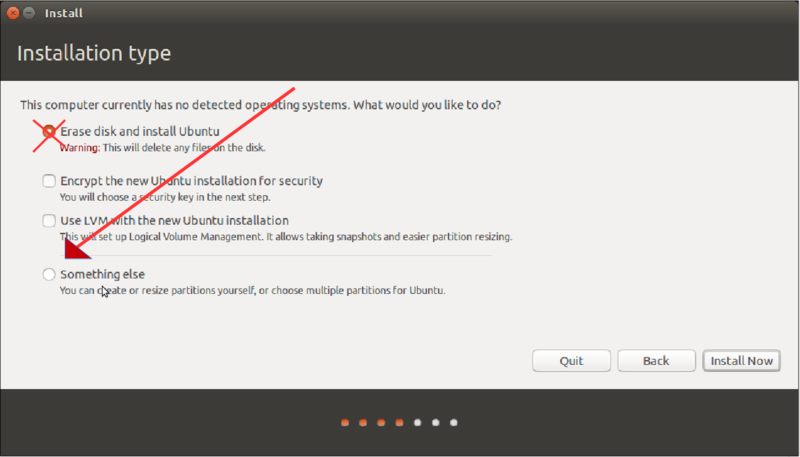 Then select the partition for Ubuntu (whether to choose sda1, sda2, sdb1, sdb2...). The interface is different from Windows installation.There is a good post explaining this matter, but read it whole especially the OEM chapter. You must know why it is better to have separate root and home partitions, do you need swap area concerning SSD drives, etc. Now Luis Alvarado already mentioned that you should have free space, for your Ubuntu partition, formed and ready before you start the Ubuntu installation. It is for the best, and you can easily do it from Windows "Disk Management". Note that this partition must be an active type partition. This is the point where laptop users should pay attention. My laptop came with Windows 8 preinstalled and with the software option for back-it-up. So it has a keyboard button near the power button, to backup/restore Windows in case something goes wrong. I don't believe you can repartition your hard drive (change its size) and not to mess up your backup software. Apparently it will alter the ID of the Recovery partition. That's why I recommend either to contact your manufacturer how to back-it-up on DVD or you can simply clone it with Clonezilla live CD/USB. It's no problem, obviously, if you have two hard drives, for example, an SSD and an HDD. Before installing Ubuntu you should really try it first. It is important to know whether Ubuntu's current kernel supports all of your hardware. When I installed Ubuntu, the installation media didn't recognize Windows 8. I selected "Something else" option from installation menu and then installed it on a disc free space. After rebooting my PC, GRUB did recognize Windows. No problems. Maybe it will be helpful for someone having this issue. I'm not sure if this works, but for my case, my laptop has 2 hard disk slot. It came with 1 hard disk with Windows 8 pre-installed. Another hard disk is from my busted old laptop, and I just plug it in. Surprisingly, I can boot to Windows 8 and Ubuntu 12.04LTS non-UEFI (of course I need to enable UEFI if I want to use Windows and disable if I want to use Ubuntu). Now my question is this: Is it possible to installed non-UEFI Ubuntu in the same partition as Windows 8, and boot it by disable the UEFI boot option? If that is possible, maybe we can temporary use this method until our grub are more stable to handle UEFI boot. By the way, currently my configuration on dual boot is like this. Another way though, is to buy one external hard disk and install Ubuntu in that external hard disk. I attempt install Ubuntu on the external hard disk and I can say quite success. I can boot Windows 8 with UEFI boot option, and I can boot external hard disk by changing the settings of the BIOS. Of course this is done using Ubuntu 12.04 LTS (non-UEFI). Anyway, in conclusion, for the mean time, avoid install Ubuntu alongside with Windows 8, as it is not very stable. I suggest using external hard disk (or if your giant laptop has 2 hard disk slot,use secondary hard disk) for Ubuntu. This will somehow avoid potential OS damage caused by M$ UEFI boot option. I had some trouble documented here. The solution which I chose for now was to install Ubuntu in BIOS mode and leave Windows 8 in UEFI. I'm not sure if this represents a problem, since in the Ubuntu community it is said that both systems need to be in the same format, but I could get both systems working. The only problem (more an annoyance) is that every time I want to change system I need to go to the BIOS setup and enable or disable UEFI. I could convert the Ubuntu BIOS to Ubuntu UEFI using this, but during the installation of Ubuntu I needed to create a Bootable BIOS... don't know what would be of that, so I preferred not to play with it. Hope this can get someone going and if you have any suggestion for me, let me know. Thanks! With Packard Bell EasyNote TE was impossible to disable Secure Boot unless we set a password in the Bios. Once we set up a password, we could change the Secure Boot value to false! I have a HP 250 with UEFI, tried and failed last year to install Ub but after reading this article, tried the new 15.04 distro and cracked it! One prob, installed, but then would not boot into Linux/GRUB, but rather than sort out the GRUB issue I re-installed wiping the entire windows OS ( never liked Win 8 anyway, very very slow on celerons ). Now boots into Ubuntu on start up and everything so far seems fine. If you are new to Linux, I would highly recommend upgrading pre-installed version of Windows to current first. I had Windows 8 + Ubuntu dual boot laptop. When Microsoft forced me to upgrade Windows 8 to 8.1 I lost dual boot UEFI GRUB loader and stick to Windows for while. Luckily I managed to repair it from Windows when I installed Ubuntu for second time. As a potential new Linux user you wouldn't like to risk loss of Windows during installation, so I recommend to look at this page and install Live USB Creator. That way you could run Ubuntu Live and then decide if you like it. Luis Alvarado gave thorough description, so if you finally decide to install follow his advice and read other sites. 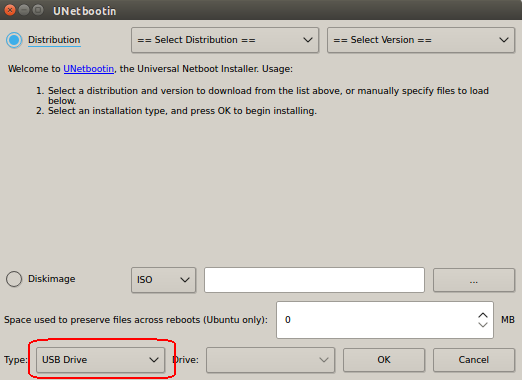 With Ubuntu, you really can't go wrong with preparing a live install media by using unetbootin. With unetbootin you can use your Hard Disk or an external flash drive for the installation media. In the unetbootin window, choose Hard Disk from the drop down menu. Choose the Ubuntu ISO you want to install from and perform the rest of the steps needed to finalize the installation. The next time you boot up your system, you will see the unetbootin boot menu rather than booting into Windows. This is fairly straightforward but you can't use this method to install OSes to UEFI-GPT systems unless you install the OS to run in legacy mode. To install to systems that use the BIOS firmware standard, this is the best and most practical method. The variation from the method depicted above is that you have to choose USB Drive in the drop-down menu in the unetbootin window. Not the answer you're looking for? Browse other questions tagged dual-boot system-installation uefi windows-8 windows-10 or ask your own question. Can I install Wubi on Windows 10? How do I Dual Boot Windows 8 UEFI and Ubuntu 12.10? Installer doesn't recognize Windows 8 partition, how do I set up a dual boot? Installed Ubuntu 13.04 alongside with a pre-installed Windows 8. Neither boot! How can I backup my pre-installed Windows 8 before I install ubuntu? Remove Ubuntu installed by wubi to install Ubuntu alongside Windows?